Woke, walked Mix, breakfasted and soon afterwards David arrived. No Tom until lunchtime today because he has other commitments. We had expected a delivery of wood this morning but it didn’t arrive until after eleven and by that time Tom was with us. So we unloaded the wood and then went for lunch at Pearsons. 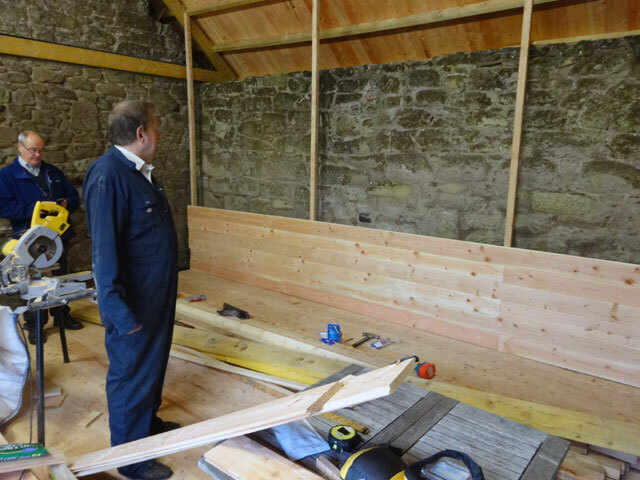 In the afternoon we set up the backing posts for the first wall and then set about starting to fit the wall timbers. We did enough (see the photograph at the head of this entry to see that it is going to look very good). Tom and David went off to their homes (David having a coffee first) and then Rachel and I joined Digger for supper in the farmhouse. Mum and Olive were missing: Olive was lecturing in Dundee and Mum was meeting a Kirkcaldy group and her friend Rosemary in Edinburgh to attend a performance of Barnum at the Playhouse. Both returned in the evening (Mum having enjoyed her day and Rachel’s lecturing having gone well), by which time Rachel was in Berwick attending her choir with Bridget – during the day today, when she wasn’t driving, Rachel continued to get things ready for her kilt-making course next week and did some more painting in the Bothy while David got her heating sorted out. In the evening I worked in the summer house trying to figure out how my video camera downloaded pictures on to the computer with a view to putting some on my web-page soon. Rachel returned and we watched the news before bed. It has been a good day.